I love baking and decorating cakes for my children’s birthdays. But I have to confess, I have such a hard time settling on the final design! Yes, it’s official. I’m indecisive. Or at least I think I am? I looked at so many photos to get ideas for this special tenth birthday cake for my eldest daughter. We had decided quite early on that the colours for the party would be pink, white and black. There are so many extremely creative people out there, and I finally found a cake that looked gorgeous, while still being something I could realistically achieve – not being a professional cake decorator and all! I made many of the other fondant bits in advance – the hearts, balls, rose buds and bow. In hindsight, I wish I had made the hearts last minute, as they would have then moulded to the curve of the cake. As it was, they stayed flat and looked a little odd. Not to worry though. I always have to remind myself that no-one looks at the cake as closely as I do! I baked two different flavoured cakes, one chocolate and one strawberry. And I need to confess that once again I used packet cake mixes. I know, how terrible, right! But I don’t have a favourite, fail safe recipe to fall back on. And I don’t want to go to the bother of trying a new recipe only to have it fail. Or worse still, to fool me by looking and feeling okay, but tasting horrible. I tend to spend most of my time on the decorating of the cake. But maybe some day I’ll find that perfect recipe so I don’t have to cheat any more! I think one batch of fondant must have been a bit old, as I ended up with quite a few little cracks on the top cake. I tried to hide most of those with the hearts! I rolled and cut stripes for the bottom half, then finished off the base with the balls. I cut paper straws to length and poked them into the bottom cake to stop it being crushed by the top cake. I added quite a few straws actually, as I’ve learned the hard way what happens if you don’t give a cake enough support…you wake up the next morning and find the whole thing leaning against the wall. Major bummer! The cute little diamante numbers I found at Spotlight. The brand is Bakery Sugarcraft and you can buy them straight from their website. 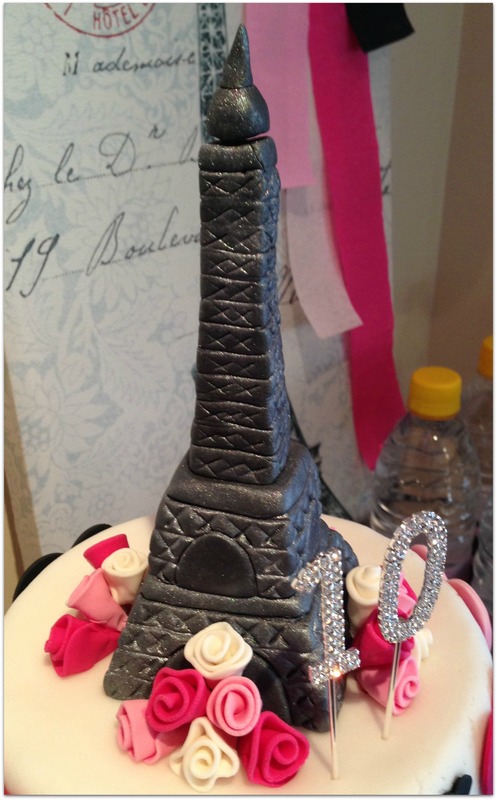 I thought they were the perfect finishing touch to our glamorous Parisian cake.